Talk about the “big Other”! Taylor’s film makes heavy use of extreme closeups to capture the animated, restless, nervously gesticulating philosopher-as-third-base-coach engaging in his characteristic stream of logical reversals and psychoanalytic reflections on political ideology and current affairs, peppered with suggestive illustrations drawn from popular culture — high, low, and everything in between. For those who have seen Žižek “in the flesh”, the representation on the screen is accurate but obscene. The iconic image presented by Taylor, which frequently fills 40-60% of the frame and viewed from below, casts a dark shadow over the viewer. Žižek claims to be a monster; not just a crazy and charismatic theoretician who, behind the façade, is really a sweet, sensitive, caring human being. No, he likes to think of himself as a kind of alien. I suppose the film, unwittingly or otherwise, contributes to this fantasmatic image. The camera follows the philosopher around his home and office in Ljubljana, Slovenia, and on the international lecture circuit. In public, Žižek is always accompanied by a manuscript hot off the press from which he reads, digresses, and reads some more, whether lecturing to a large auditorium in Buenos Aires or to a small group in a SoHo art gallery. After the 60-90 minute lecture there’s a Q&A lasting nearly as long. One quickly learns why his friends call him Fidel. When asked what would seem to be a straightforward question, often to clarify a rather minor point, he’s likely to talk nonstop for an hour. Although she has some 80 hours of footage, Taylor never lingers for long on Žižek’s expectorations. (Perhaps they’ll make it on to the DVD.) Rather than conveying his views through the dazzling intensity and duration of a Žižek lecture (which would be truly avant-garde — think Godard around 1970 — but commercial suicide), she provides philosophical soundbites — brief quotes taken from Žižek’s writings — as textual interludes. Unlike Taylor, I claim the subject of Žižek! is idiosyncratic. What we witness is the plight of the “crude” (his term, not mine) Lacanian/Marxist philosopher, well-versed in German Idealist philosophy, a lover of classical and romantic music, fluent in several languages, an avid reader of novels (high and low), with a repertoire of dirty jokes, who has seen more films than all of us put together and knows how to use all of the above to illustrate the day-to-day workings of ideology, elucidate the most arcane psycho-analytic concepts, and consistently delight his audience with surprising insights into human experience which constantly defy common sense and conventional pieties. After the screening on opening night, Žižek was present for “a brief” Q&A. This, of course, provided the filmmaker an opportunity to capture more material for the “special features” section of the DVD release of the film. But for Žižek it was the return of the repressed. Following Astra Taylor’s acknowledgement of the contributions of her crew, Žižek said that he did not intend to thank anyone. No way. The experience was boring and painful. Period. That said, he turned to the manuscript in his hand and launched into a brief critique of the film — he found his own appearance grotesque and unappealing — followed by a lecture on Stalinist history and Lacanian ethics. He ended with one observation and a command. All of Lacan’s talk in the late writings about James Joyce, he claims, is misguided. The writer that best captures the subject of Lacanian ethics is Beckett who embodies, in The Unnameable, the will to go on in spite of the utter impossibility and absurdity of life. Ironically, perhaps, I thought again of Chomsky, who continues to work as ardently, consistently, and obsessively as Žižek. While I can’t go into it here, I suspect that there’s a hard-working radical enlightenment monk somewhere in Žižek. In any case, the two exemplify the unflagging persistence that so often appears in Beckett. In typical Žižekian fashion, his lecture exceeded the limits allowed by the institutional framework. 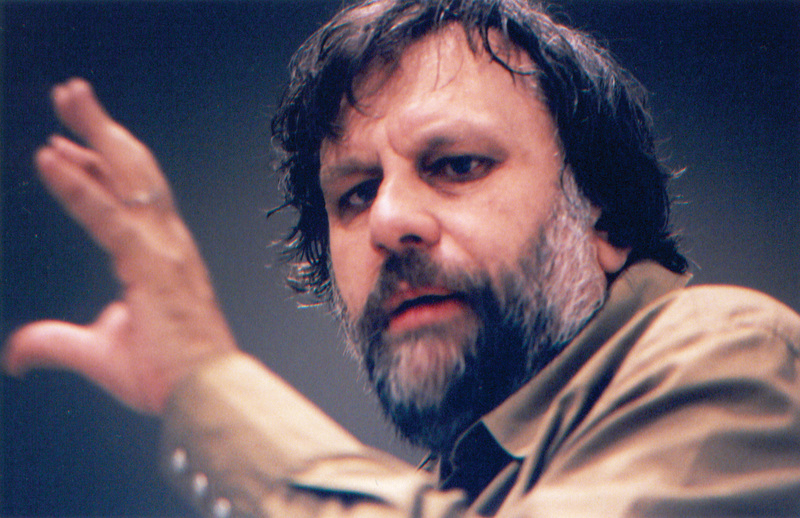 The IFC’s manager, at the side of the stage, repeatedly signaled the filmmaker, seated on the stool next to Slavoj, to give Žižek the hook. Taylor placed her hand on his shoulder saying, “We have to go.” “Yeah, yeah, I know. I’ll stop immediately”, Žižek said, and then continued answering the question he’d been asked about Bukharin’s relation to Stalin. * Astra Taylor, quoted in “The Žižek Effect” by Scott McLemee. Photo by Kate Milford courtesy of Zeitgeist Films website. Žižek!, a documentary by Astra Taylor which attempts to portray “the man and his ideas”, opened in NYC last night with an 8:00 PM screening at the IFC Theater and a “Q & A” with Žižek after the film. Žižek also lectured to an overflow crowd in Swayduck Auditorium at The New School where he has taught and lectured frequently over the last decade or so. 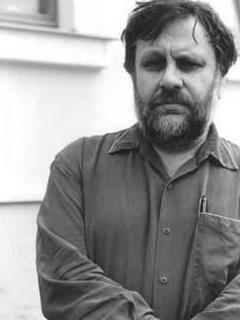 The Slovenian philosopher Slavoj Žižek brings to the academic and cultural scene in the U.S. a phenomenon well-known in other parts of the world — the avant-garde intellectual as both provocateur and public figure. Some of the best known recent examples have come from France and include “authors” such as Jacques Lacan, Jean-Paul Sartre, Michel Foucault, Jacques Derrida, and Gilles Deleuze. In France and many other European countries where television, radio, and the media generally operate in a more critical and sophisticated environment than one finds in the U.S., such “public intellectuals” are often exposed to a large audience. In this country, the circulation of philosophical ideas and the “buzz” surrounding those who offer novel and often surprising approaches to the ways in which we think about and conceptualize human experience and social relations are typically limited to artists, writers, designers, graduate students and junior faculty in the social sciences and humanities hungry for alternatives to what they perceive as a moribund intellectual climate resistant and irrelevant to contemporary experience. The “general public” is not exposed to such emerging trends in intellectual fashion. If anything, they get wind of highly mediated caricatures used by neoconservative critics to stir up public resentment and political opposition to a “liberal agenda” in the culture wars. Given both his interest in popular culture and the hyperbolic commercial channels of PR in this country, Žižek has become “an intellectual rockstar”. The scene at The New School was a typical example of the response to a Žižek “appearance”. The lecture was sponsored by the philosophy department at the (recently re-branded) New School for Social Research (f/k/a the Graduate Faculty of Political and Social Science or, simply, “the GF”, and now affectionately referred to by insiders as the “NewSSR”). There was, for all intents and purposes, no publicity other than a few internal and very low-key announcements along with word of mouth. The lecture was scheduled to begin at 4:00. By 3:30, every seat in the auditorium was filled. Those who did not arrive in time for a seat were standing in the aisles from front to rear on both sides. A number were seated on the floor of the speaker’s platform and several curious onlookers were standing in the back in the sunken vestibule of the room occluded by a wall of chairs with no view to the front. There was a line outside hoping to get in and many others who were turned away. Roughly four hours later, over on Sixth Avenue at the IFC Theater, the screening room was packed. After a brief introduction by the manager of the theater and the filmmaker, Astra Taylor, and a short by D. A. Pennebaker from 1958, Žižek was on the big screen.